I read and LOVED Between You And Me by Lisa Hall earlier this year. I was blown away by it to be honest! I was super excited to get an early review copy of Tell Me No Lies to read, and I know I was a little apprehensive that it may not live up to BYAM. I needn’t have worried because Tell Me No Lies was absolutely brilliant! Psychological thrillers are the BIG thing this year. There has been a glut of them and I read so many, that unless there is something special in there, they all blur into one when I try to remember anything about them. Lisa’s books have the something special and then some! Tell Me No Lies starts out innocuously enough, but just as with a spider web and a fly, the reader gets pulled in and cannot escape the inevitable. I devoured this book, I didn’t want to put it down. At times I had to remind myself to relax as my body was knotted with tension at some parts of the book. When I finished, both angry and breathless in equal measure, I had to message Lisa with a shouty emoji message!!! I just couldn’t comprehend what I had read! In the best way possible obviously! I won’t go into the plot, especially seeing as how the blurb is quite ambiguous, but I will say it’s absolutely an excellent book! Tell Me No Lies has most of what I look for in a psychological thriller. A great cast of characters, a fast-paced plot, tension and frustration in equal measure! I loved it, really LOVED it. I cannot recommend it highly enough! It was super quick! I submitted the first three chapters of my manuscript at the end of September, and two weeks later received a phone call from my now editor, asking me to send her the rest of the book. A week later, she contacted me to offer me a two-book deal! What made you choose to write a psychological thriller? I didn’t set out to write a psychological thriller – it just turned out that way. I always thought if I wrote a book it would be more of a chick-lit/women’s fiction novel, so I was quite surprised when things went the way they did. 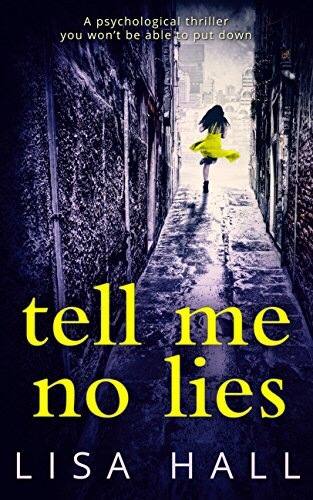 How would you describe Tell Me No Lies to readers who have yet to pick it up? I’d like to say it’s a gripping read, and hopefully those who have read it will agree! It’s a story that looks at how well we know the people we let into our lives – I tend to take people at face value, and I wanted to look at what would happen if a character let someone into her life who perhaps wasn’t the person she thought they were. There are so many good things about being an author! Meeting readers and getting to spend my day making things up feature pretty highly. It’s always hard to receive negative reviews – that’s probably my least favourite thing. I found them really upsetting at first, but now I just don’t bother to read them! I’m happy where I am right now, so hopefully I’ll still be doing this – I’ve got a brilliant team behind me at HQ, and I’ve got a ton of ideas. I’ll keep writing all the time people want to keep reading me! I’ve just submitted book three to my editor, so I’m waiting on edits and working on a little secret project while I’m waiting, plus I’m starting to research book four. Then there are the characters dancing around in my head, begging to be put into book five…. Gone with the Wind is my all-time favourite book, and I’ve re-read it a million times. It’s like a reading version of comfort food for me – the ultimate love-story, but with a fantastically feisty heroine. Have there been any books you’ve read that you wish you had written? Tall Oaks by Chris Whitaker. It’s a brilliant, brilliant novel, with a perfect sense of location and some amazing characters, all woven together with secrets and lies. If you haven’t read it yet, you really should. Reading, mostly! I don’t get a lot of spare time, as I have lots of children and lots of animals, so any spare time I do get I like to chill out with a good book. I don’t have time for hobbies! As I still work part-time for our family business, by the time I’ve squeezed my writing time in and fed my children I’m ready for bed! New York, hands down. We went for the first time this year and I just fell in love with the whole place. I’m a fiend for the cheese. Any cheese. I’m a big tea drinker, but I won’t say no to a glass of wine! 😀 It was awesome, I also loved the ending!